The year 1873 marked the end of the Liberty Seated Half Dimes and Dollars. The dime, quarter and half dollar denominations underwent a weight change during the year as part of the same law. 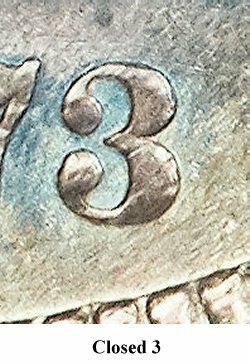 The change, which was implemented after coinage production had begun for the year, was denoted by arrows added on either side of the date of the “new” weight coins. Quarters minted by the Philadelphia and Carson City mints during 1873 are thus one of two types – with arrows and without arrows. 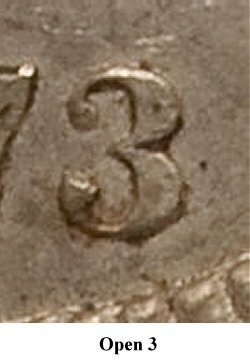 The without or “no arrows” Philadelphia quarters are further subdivided into two significant varieties denoted as “open 3” and “closed 3” – referring to the spacing of the knobs of the 3 in the date. The business strike 1873 no arrows closed 3 quarter is a quite rare and popular variety amongst seated quarter collectors. Most known examples are low grade and/or have problems. Problem free examples of this variety are excessively rare in XF or better. The finest known specimen (NGC MS63) of the variety sold for a record $74,750 in Heritage FUN 1/2008:2785. The situation becomes more interesting if one considers the proofs minted in Philadelphia during 1873. Though correctly considered a different issue from business strikes, many collectors, including Eliasberg, have substituted relatively common proofs for very rare business strikes in their sets. All 600 proof quarters minted in 1873 were of the closed 3 variety and are challenging to distinguish from high grade business strikes. PCGS and NGC have certified over 300 of these no arrows closed 3 proofs. The survival estimates in Briggs’ Comprehensive Encyclopedia of United States Liberty Seated Quarters suggest that around 140 business strike no arrows closed 3 quarters exist in all grades combined. Though there are many hundreds of low grade (below VF) no arrows open 3 quarters, estimates suggest that Choice VF and better examples exist in similar numbers (i.e. around 150 pieces). Though considerably more expensive, the 300+ proof no arrows closed 3 coins are apparently twice as available as VF and better business strike no arrows open 3 examples. There are two conclusions to be drawn from these numbers and observations. First, a nice proof 1873 no arrows closed 3 quarter offers the set builder a less expensive alternative to the very rare and expensive business strike. Second, the 1873 no arrows open 3 is more of a condition rarity (in choice VF and better) than price guides seem to reflect and is a good purchase when a nice example can be found – which isn’t very often. The no arrows closed 3 and open 3 quarters (and other denominations) have been written about in the Gobrecht Journal a number of times recently. Specifically, Issue 99 p. 30 “The 1873 Closed 3 Quarter and Its Reverses” by Len Augsburger; Issue 101 p. 49 “1873 Closed 3 Over Open 3 Comparisons” by John McCloskey and Bill Bugert; Issue 102 p. 38 “1873 Closed 3 and Open 3 Proof Coinage” by Bill Bugert and John McCloskey; and Issue 108 p. 3 “Reinventing the Standard Catalogue: Liberty Seated Line Drawings from the John J. Ford Library” by Leonard Augsburger.